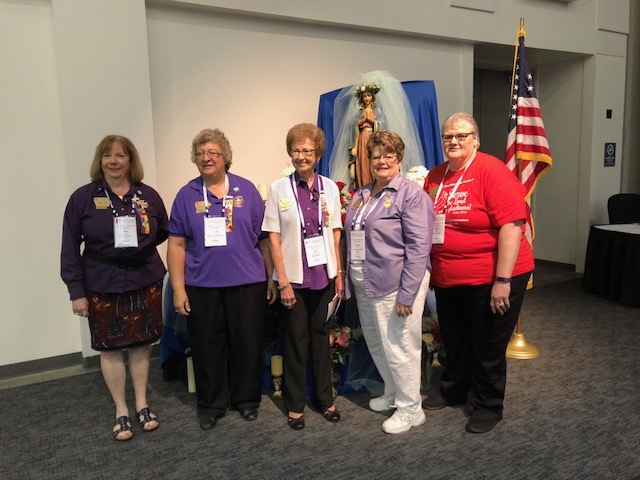 The 2018 Catholic Daughters of the Americas National Convention was held July 18 – 22 in Sioux Falls, SD. Close to 70 Iowa CDA members and guests attended. Pictured above are the Iowa State Officers, left to right: Rita Carlson State Secretary form Fort Dodge, Karen Kasparbauer First Vice State Regent from Manning, Jan Grundmeyer Iowa State Regent from Manchester, Darlene Moritz Immediate Past Iowa State Regent from Milford, and Deb Steger Iowa State Treasurer from Dyersville. The Theme for the Convention was “Serve the Lord with Gladness” Psalm 100:2. Elected to Regent Elect (will be National CDA Regent in 2020-2022) is Sherry Niles from Sheldon. Reelected to a National CDA Director is Rose Holschlag from New Hampton. Elected to the 2020 National Nominating Committee is Darlene Moritz from Milford. 2018-2020 National Regent is Olga Samaniego from Texas. Her theme is “Speak Lord, for your servant is listening”. Bishop Brendan J. Cahill of the Diocese of Victoria, TX, is the new National Chaplain. Father Edward Lamp of Florida is the new National Clergy Consultant. Next National CDA Convention in 2020 will be in Dallas, TX. A wonderful time was had by all in Iowa City on June 24, 2018. Check out the photo gallery to see some of the fun! Anna Baxter is the only National Regent from the State of Iowa, we honor her and her work with Catholic Daughters of the Americas. Anna was instrumental in the Institution of several Courts in Wisconsin and Iowa. Meet Past State Regent of Iowa Anna Baxter. Anna Baxter continued with the Catholic Daughters to become the National Regent from 1968 to her death in 1970. She was one of the “Decade of B’s: Buckley, Ballard and Baxter” as put in the book published by the Catholic Daughters of the Americas in 2003, “The Catholic Daughters of the Americas, A Century in Review”. If you ever get the chance to get your hands on this book you will learn a lot of history of the Catholic Daughters. This book is available to purchase through your court at the National Office in New York and your State officers will have some at Anna Baxter Day in Iowa City on June 24, 2018. Anna (Boyle) Baxter had seven younger siblings and grew up in Darlington, Wisconsin. 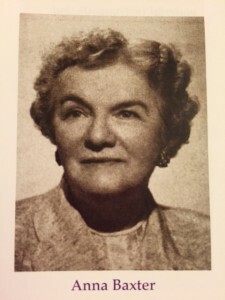 She married Frank Baxter in 1913 after completing college at the University of Wisconsin, teaching English at a high school and being an assistant Principal. They moved to Iowa so that their three high school aged children would attend a Catholic High School in Dubuque. Anna was a Catholic Daughter in Wisconsin and worked to get the Wisconsin Catholic Daughter State Court going in 1923. She was Wisconsin’s first State Regent. While in Wisconsin she was nominated in 1925 as a national director and continued as director when she moved to Iowa. She later became a State Regent in Iowa. For 45 years Anna was active on the National level sharing her talents and treasures. Baxter developed the ‘Sevenfold Program of Involvement’ which we today call our “Circle of Love”. Anna must have been a real ‘go getter’ in all her endeavors. 29 courts in Iowa alone were started by Anna Baxter and some in Wisconsin. Iowa Catholic Daughters of the Americas have an exciting legacy of leaders and look forward to the new leaders in the future.